Pondering at the edge of the mountain, the three peaks of Dauladhar range from which Triund gets its name (Tri = Three/ Und = Peaks) stood in front of me majestically, and I looked back. A few tents studded across the meadows. The day hikers preparing to return back and the crowd became thin. I trod on the rocky mountain observing the vastness of the mountain and the expanse of the Kangra Valley. There was an eerie silence, for which I have traveled solo a few thousand miles. I started off from Dharamkot finding my way through the sparsely inhabited interior of the village to reach Gullu Temple, where the trek starts. Walked uphill in the laid down path, shadowed by pines, oaks, cedars and rhododendrons. The sun was moderately strong and the wind caressed gently. Meet a few fellow hikers – a father and his two daughters of age about 17 and 7 respectively and a group of three guys from Delhi. We exchanged words and soon we reached The Magic View cafe, the name upholds the ethereal imagery. The trek after MagicView cafe gets a bit strenuous. After three hours of panting and meandering through the zigzag rocky path, I reached Triund. The lovely meadows with flocks of hikers of a wide spectrum of ages and having a happy time was a sight unforgettable. Booked a tent from one of the five cafes, which provides tents and food, and camped. I trod in the rocky landscape observing the Gaddis (the local Himachali people) shearing sheep while the sun rested beyond the horizon of Kangra Valley. Down below Dharamshala, Mcleodganj and Dharamkot shimmered in yellow. As the day unfolded, two solo hikers – Siddharth and Chris became my neighbour. The dusk arrived, the sky stud with a million stars and it became colder. We sat by the bonfire and sipped chai. Soon after we had dinner in the cafe and walked around the place in biting cold and sat in some desolate rocks. The whole terrain was pitch dark as the place is devoid of electricity and only the cafes were dimly lit by solar lamps. Talked for a while and headed to one of the tents for a few swigs. Soon we rested in our individual tents. The sleep was broken and uneasy as the temperature dropped over the night. We woke up early, to view the sun rise from behind those majestic mountains. It was still visibly dark and few peaks glowed yellow. Keeping the camera for a sunrise time-lapse, we went for a ramble to enjoy views and to sunbathe. After a while in the early afternoon, Chris and myself decamped to Dharamkot. 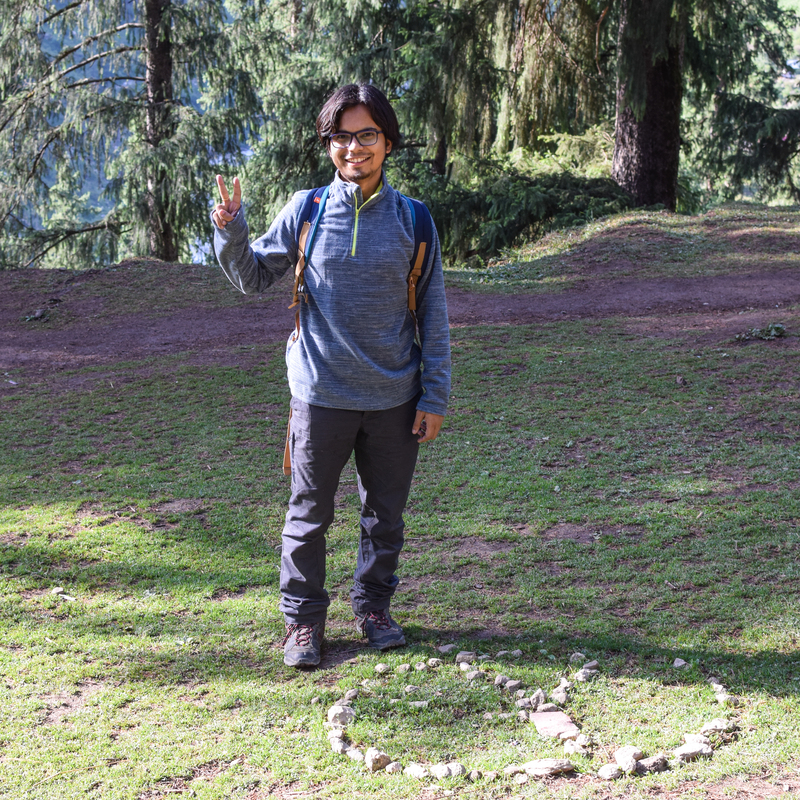 When I lodged back in my room, tired and with sore legs, in Dharamkot and retrospected at the trek, a feeling of freedom and completeness evoked inside me. Travelling solo it in itself a profound joy; complimented by a lovely place and warmhearted people it is overwhelming. The best room I ever stayed in. Homecoming smile of the shepherd. His home at left. He travels all across North India with his herd of sheep – from Himachal to Punjab to Ladakh (Jammu & Kashmir) and back to Himachal. He is back to home from Ladakh after 3 months of travel.